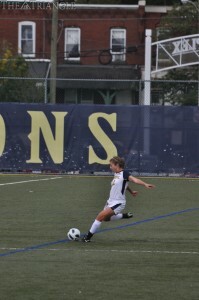 Drexel women’s soccer team tri-captain Jourdan Halasz approaches the ball for a free kick at Vidas Field. The Dragons and Halasz have won two straight games and three of their last four, due in large part to the stellar play of sophomore goalkeeper Eve Badana, who leads the CAA with seven shutouts in this season. After surviving a challenging three-game road trip through the Colonial Athletic Association’s southernmost and northernmost teams, the Drexel women’s soccer team has the best record in the conference. The Dragons took two of three from the University of North Carolina Wilmington, Georgia State University and Northeastern University. The trip got off to a bad start when Drexel was blanked by UNCW 2-0 Sept. 28. It was the Dragons’ first conference loss of the year, and it snapped their nine-match undefeated streak. The two teams were scoreless in the first half, but the Seahawks broke the tie in the game’s 51st minute with a goal from Amanda Holmes. Caitlin Hunter, UNCW’s goalkeeper, kept each Drexel shot out of the net and made six saves. Maddie McCormick then sealed the game with an insurance goal with about five minutes to go, scoring off her own rebound. To get back in the win column, the Dragons turned in another excellent defensive performance Sept. 30, this time being the team posting the shutout. Junior Sam Greenfield started the scoring with her third goal of the season, as all three of her goals have proven to be game-winners for Drexel. In the second half, Georgia State failed to record a shot on goal, managing only two in the match. Gabby Dixon’s goal with about two minutes left to play ensured the victory. The rubber match of the three-game road trip was also a shutout, and Drexel was on the winning side again. They blanked CAA rival Northeastern 1-0 Oct. 4. The game was a well-played, scoreless contest for more than the first half of the match. In the first 45 minutes there were very few scoring chances for either side, a time in which there were only five total shots for the two teams. It remained scoreless for much of the second half, too, but Drexel would finally break through in the 74th minute on a goal from senior Alex Vazquez. Sophomore Eve Badana made a few big saves late in the game to preserve the lead, and it made for back-to-back shutouts for Drexel. The Dragons now have eight shutouts on the season, good for second in the conference. They are also second in the conference in fewest goals allowed, having only yielded nine through the season’s 13 games. Thursday’s game also marked the third time they followed a shutout with another shutout. Only 13 games into the season, the team now has the most wins in program history with nine. Next on the schedule is a pair of matches next week, one home and one away. The Dragons will return to Vidas Field Oct. 7 for a 1 p.m. game against the Hofstra University Pride, who have yet to lose in CAA play. Following that, they will visit Old Dominion University Oct. 11 for a 4 p.m. contest. The Monarchs have struggled this season, only able to pull out two wins thus far, and are 0-3 in the CAA. Hofstra and the University of Delaware are the only teams with more conference wins than Drexel at this point in the season, having already posted four each.